Nestled into the magnificent Ozark Bluffs, lavish Edgewater Estate offers avant-garde style reminiscent of Frank Lloyd Wright’s architectural masterpiece home, “FALLING WATER”. This 6 level, 8,500 sq ft home offers an intimate setting for any private or professional event. Glass, mirrors and shimmering lake waters will melt away your cares as you relax on the 5,000 sq ft of decks and admire the awesome sunsets and the six mile panoramic view of the gorgeous Lake of the Ozarks. This home whispers elegance with its unforgettable design and unique décor, all touched personally by professional designers. You approach the private 11 acre property through the impressive wrought iron gates and stone pillars. Beauty greets you at every turn with well-kept landscaping and a plethora of lovely flowers. If you appreciate wildlife, you’ll love our resident deer, the family of foxes, a family of raccoons and an array of small creatures and song birds natural to Missouri. A magnificent Bald Eagle nests close by and often soars along the lake side view of Edgewater Estate. Entering through the stately front glass door, you will be amazed by the first sight of the stylish GREAT ROOM which has 22 foot ceilings accented with mirrors. The entire front wall is glass providing that breathtaking panoramic view of the lake. Guests will enjoy the 60-inch television screen, Wii & games, surround sound system, Baby Grand Piano, Pool Table, Telescope, 2 seating areas, 6 ceiling fans and raised fireplace with an artist’s striking 20’ design above it. The Great Room is spacious and is open to the formal dining area with a 12 seat, eclectic dining room table. Multiple sliding glass doors on each end of the room pocket back several layers to open up to the wrap-around deck and the 15X30 ft, 4 ft to 8 ft deep, heated, suspended SWIMMING POOL, and HOT TUB and GAS GRILL, overlooking the main channel of the lake. The pool deck patio enjoys a sound system controlled from inside the house and all decks come furnished with a multitude of tables, chairs and lounges for comfort and convenience. 3 levels of Edgewater Estate are serviced by a completely glassed-in elevator for your convenience with luggage. Whether you cater your visit, order in or plan to prepare delicious meals or snacks yourself, the fully appointed FAMILY KITCHEN will support the most diverse menu. It is open to the Great Room and has a long bar with comfortable seating for 6. The CATERING KITCHEN with pass-through to the Family Kitchen boasts an in-door grill, a double-basket deep fryer, a large built-in griddle and a warming drawer. The two kitchens have 3 sinks, 2- refrigerators, 2-dishwashers, 2-stove/ovens, an icemaker and all the amenities, appliances & supplies needed. The OFFICE is also off the Great Room and if you can’t seem to break the computer habit even on vacation Edgewater Estate offers Internet, Wi-Fi and Printer-Fax-Copier ensuring you are always connected when you need to be. We have Installed 5 new HVAC units in spring 2015 and have 3 other units that were installed 4 or 5 years ago. The BEDROOM SET-UP: All the bedrooms at Edgewater are large, have large closets, comfortable mattresses, high quality linens and towels, new HD flat screen TVs and DVDs, sliding glass doors to decks, unique ceiling fans and their own private bathrooms which all stock hair dryers, curling irons and guest toiletries. On its own level in the house is MASTER BEDROOM #1. It has a King-Size bed and a walk-in closet and built-in dresser drawers, a bathroom with two sinks, a private toilet room and a double shower. It also has its own glassed-in “SPA ROOM” with a two-person hot tub. One level down is MASTER BEDROOM #2. It hosts another King-Size bed which has a top-of-the-line Sleep Number mattress, a matching dresser, a comfy chaise lounge and a thick couch that folds down into a double-size bed. The bathroom has a Jacuzzi-style bathtub along with a shower. BEDROOM #3 is the Twin Bedroom. Dresser and soft swivel chair complete the furnishings for this black and confetti-design room - can easily be converted to a K S bed. BEDROOM #4 has another King-Size bed and matching dresser, and an easy chair. BEDROOM #3 and BEDROOM #4 each have their private sinks and commodes, but share a shower w/ locking doors in-between. BEDROOM #5 has a private bath with shower. The Full-Size bed and dresser are a unique design and the built-in end tables have telescoping shelves for the convenience of morning coffee and breakfast in bed. Another soft swivel chair and floor lamp fill out the reading corner. Our fun BEDROOM #6 is the Dorm-room that holds two over-sized bunk beds (real king size mattresses on the bottom and real queen size mattresses on top) as well as a new Queen-Size bed, sleeping 8 - 10 people total. The X-Box game is in here. One long wall is floor-to-ceiling glass covered by high-end blackout blinds. The private bath for this bedroom has a shower and double sinks. 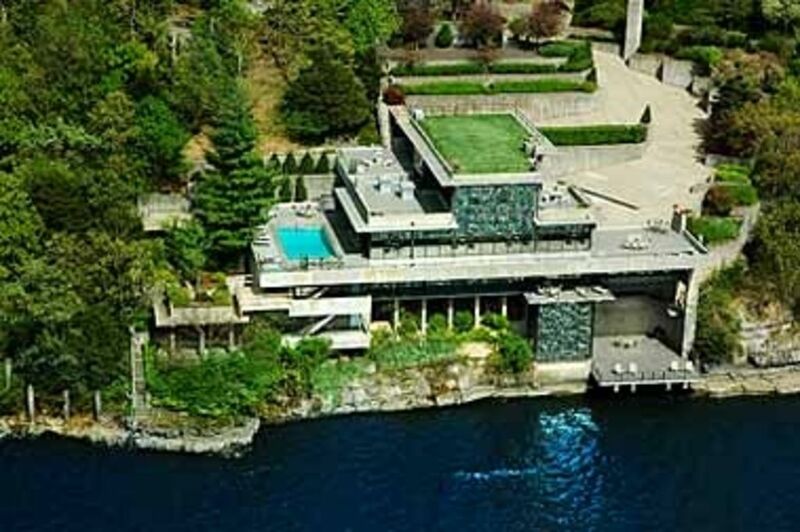 Literally built over the lake is the WATER-LEVEL BAR, with 22 foot walls of glass. It’s a great place to unwind and let the good times roll while you enjoy the amazing view of water and sky and relax with your favorite beverage. This bar and lounge area, seating 12, is equipped with a sink, refrigerator, dishwasher, TV and half bath as well as a 150 Game MEGA TOUCH video game. The adjoining 30 X 35 ft covered BAR DECK PATIO is perfect for fishing. On the landing above this bar is Fooseball, a treadmill and a relaxing massage chair. On the property there is a regulation-size TENNIS COURT (4-tennis racquets & tennis balls if you forgot yours) for your enjoyment. Extensive DVD, VCR, CD, Book and Game Library! There is ample open parking space as well as a 3-CAR GARAGE & a 3-CAR CARPORT. Secluded & private, Edgewater Estate is seated right in the middle of all the great amenities the lake has to offer! Come and enjoy the beauty of Spring and all of the Summer fun at Edgewater Estate. Whether you are golfing, boating, swimming, sightseeing or just need some overdue family time together~this is your place to be. Ask about our two new Wedding Venues that we have available within minutes of the property as we no longer allow weddings at Edgewater. If you are interested in Wine, we can arrange some events just for you and your guests to enjoy during your stay with us. If you need more room see our VRBO Listing #398563 for our 4 Bedroom Penthouse Condo. Keywords: Lakefront Estate Home, Luxury Waterfront Home, Luxury Vacation, Golfing Vacation, Family Reunion, Corporate Retreat, Wedding & Reception Venues Near-by, Shopping Trip, Sportsman's Getaway, Lake Ozark, Osage Beach, Bagnell Dam, Lake of the Ozark, Fishing Trip, Winery Experience, 50th Anniversary trip, Team Building trip. We first purchased the home we live in (called “the white house”), also located within the gated property, and shortly thereafter we ended up purchasing the entire estate grounds and the other two houses, Edgewater Estate and the owner's Guest House. After we (sort of) retired, we moved down to the lake full time from St. Louis to enjoy the more relaxed and fun lifestyle here in our own personal “Shangri La”. We have six incredible children, all grown and living in St. Louis, Kansas and Phoenix. We also have 15 precious grandchildren who we’re convinced will win awards someday. They have all enjoyed Edgewater Estate for years, and now it is time for Edgewater Estate to be enjoyed by others too! We feel a great responsibility to the upkeep and restoration of the home. Our efforts are continual to ensure this magnificent work of art and architecture offers sanctuary for many years to come. Note: We do not rent our Guest House. Years ago we purchased a 3 bedroom condo close by to become more acquainted with the area. We quickly fell in love with the beauty of the Ozarks and all of the activities, entertainment and especially the nice people we met. We moved up to a 4 Bedroom Penthouse Suite to encourage visits from our growing brood. When that proved too small for us, we purchased our current home, next to Edgewater Estate which filled our needs nicely. Our extended family chooses to often spend vacations here with us because they can’t find a location they like better. We believe we have made a fine choice. We feel blessed to live in a beautiful resort area – to have the water and the woods and the awesome sunsets, yet still enjoy the feeling of living in a friendly smaller community where everything we need is just a couple of minutes away. There are full bathrooms in all bedrooms except bedroom 3 & 4 on the bedroom level. Those bedrooms have a private toliet and sink area each with locking doors, however they share the shower in the middle between the two rooms. Bedroom 6, the bunkroom, has a shower/sauna, two sinks and no tub. There are also 2 half baths, one off the main living area and 1 on the lowest bar level of the home. There is one pool bathroom off the catering kitchen , that also has a shower. Multiple Zones for your individual tastes! Multiple Zones for your individual tastes, plus floor heating. Large gas fireplace with remote control. High End Towels and Beach Towels provided. (2) Family Kitchen and Catering Kitchen with pass through: 3-sinks, 2 refrigerators, 2-dishwashers, 2-stove/ovens, 2-microwaves, 1 warming drawer, 1 ice maker, all amenities, supplies & appliances you will need. Baby Grand Piano, Heated Imported Marble Floors, Original and Limited Edition Works of Art, Professional Telescope, High-End Furnishings, Pool Table, Foosball Table, 150-game MEGA TOUCH video bar game, Private Regulation Size Tennis Court with 4 Tennis Racquets and Balls, Gated Property with Elegant Entrance and Beautifully Landscaped Grounds, Heated Driveway, Hair Dryers, Curling Irons & Toiletries, Irons and Ironing Boards,Treadmill, Massage Chair, High Chairs, Pack N Plays, Beach Towels. Great location for relaxing family vacation. House was fully stocked, spacious and most comfortable. The pool was cleaned and checked daily and we had a delightful stay. The grandsons loved the “fishing deck” and the teens enjoyed the bar area for late night game playing. Also enjoyed “boat watching” on the main channel, waved to everyone who passed. Great week of Family fun! House had lots to offer and plenty of space for everyone to spread out. Great for a large group! Great place for a family vacation. Gorgeous views right on the main channel of the lake. Nice pool and hot tub was a big hit with the grandkids. Plenty of space to stretch out in and entertain, or numerous small spots to get away if peace and quiet is needed. The grandkids loved the bunk room and the parents liked the privacy of their own bedrooms. There were quite a few games and toys for the grandkids to play with. The property staff was responsive to questions and concerns, and were great to talk to. Even the owner, Lynn, came by and we talked for almost an hour about the house, the area, and life in general. We felt most welcomed, and would highly recommend Edgewater Estates to anyone, especially families wanting some quality bonding time. We had 9 adults and 7 grandchildren (ages 1-9) at the Edgewater Estates for a week. We enjoyed the house overall, tennis court, pool, owner's dock and spectacular view. We had a great week and our time together. However, I would not recommend for young children or elderly. There were certain parts of the house we were not able to access due to insecure or no railings. We had unexpected leaks in several rooms as well after a rain which we had to contain with buckets. Beautiful home, great lake view! My family spent a week at this home. There were 21 of us ranging in age from 3 months to 82 years old. The house fit us all comfortably. The bedrooms were spacious and the concrete design kept noise to a minimum. The ample deck space allowed everyone to spread out and comfortably watch the parade of fabulous boats that came by to wave at us every day. The only negative I would have about this home is it needs a little TLC. There was peeling wallpaper in the kitchen, toilet seats that needed tightening, pool and spa tiles that needed cleaning and appliances that no longer functioned (bar ice maker). Some of the items mentioned on the website were non-existant (margarita machine) and the welcome book stated there was a kitchen inventory book that referenced shelf numbers so you could find things in the kitchen. Sadly, this book was non existant as well. None of this would keep us from staying at this home again, just hope the owners will take note and spruce it up a bit. The house is an amazing piece of architecture and deserves to be well taken care of. I don’t remember the exact dates of our stay, but I just realized I forgot to leave a review. Our entire experience here was amazing. Legs are exhausted from going to the lower levels that the elevator didn’t access. The property is enormous. Had a blast and Would do it again if I could find a way to rent a nice big boat to keep dockside. 15 fine Golf Courses in the immediate area, Waterparks - 1 Indoor and 1 Outdoor, Largest Outlet Mall in Missouri - 110 Quality Stores, Motor Speedway, Two Beautiful State Parks, Helicopter Tours, Boat & Jet Ski Rentals, Branson-Style Shows & Concerts, Wineries, Go-Carts, Bumper Cars & Bumper Boats, Skeeball, Arcades, Shooting Range & Trap Shooting, Hunting & Fishing Guides, Bass Tournaments, Fun Boat Poker Runs, Zip Line, Laser Tag, Segway Track, Zorb, Miner Mikes, Batting Cages, Fine Dining to On-The-Water Casual Restaurants to Franchises to Fast Food. NOTE: Please note Cancellation Policy on your Rental Agreement as it differs from VRBO. The 7th Night stay is always FREE. For Weddings, Receptions or other Large Scale Events, please inquire about our Winery locations just minutes from the Edgewater compound. We no longer accept wedding or reception events at the Estate, however Edgewater is a wonderful place to enjoy as your Wedding Headquarters. Rehearsal Dinners, Sunday Brunch and any other pre or post wedding festivities are welcome. When reserving Edgewater, if you have over 20 people, please see out Penthouse Condo listing # 398563 which us less than 10 minutes from Edgewater.